Griffyn was a surprise but welcome addition to our pack. We hadn't planned to add anymore dogs to our home but when we saw pictures of this little guy and talked to Lori Evans it seemed like it was meant to be. Griffyn is a cousin to our Anubis and Cairo and we just love his type. He has a super mellow disposition and always seeks to please. He is a pure joy to live with. He is typically the first to say hello to people or other animals. Everyone who meets him falls in love with his sparkly disposition and sweet temperment. Griffyn is incredibly fast and extremely agile and he loves to lure course and race. Rally will be next up for him in the future after he finishes conformation! At the tender age of 8 months, Griffyn earned his first group placement by going Group 4 at the Auld Lang Syne Dog Assoc. That same weekend he took 2 Best Puppy in Group wins! What an amazing boy. At 9.5 months old, Griffyn finished his Canadian Championship by going BOB and made the cut in group! We are thrilled with how he is turning out. At 14 months old, Griffyn earned his UKC Championship title in one weekend by earning 2 Group 1s and 2 Group 2s! At 15 months old during the PH Specialty in Canada Griffyn takes Best in Specialty Show!!! 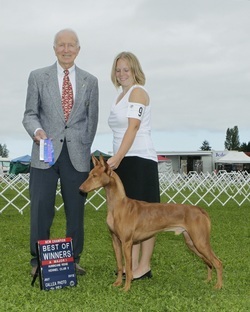 01/28/12 Ladies Kennel Club of B.C. 02/18/12 Mt. Cheam Canine Assoc. 02/25/12 Lower Mainland Dog Fancier's of B.C. 02/26/12 Lower Mainland Dog Fancier's of B.C. 10/11/14 Fraser Valley Dog Fanciers Assoc. 02/20/15 Mt. Cheam Canine Assoc. 03/23/2013 Western Washington Whippet Assoc. 05/25/2013 Western Washington Whippet Assoc. 05/26/2013 Western Washington Whippet Assoc. WD, BOW, 3 pts (major) New AKC Champion!!!! BOB, 3 pts (major) New AKC GRAND Champion!!!!!!!! WD, BP, BOW, BOB, 2 pts (major) New CKC Champion!!!! BOB, 2 pts, Group 1, New CKC Grand Champion!!!!!! BM, BOB, Group 1, 25 pts New UKC Champion!!!! BOB, Group 1, V-1 Excellent New Int'l Champion!!! 1st Place, 5 pts (major) New Field Champion!!!! !